Congratulations to the Northern Neck Rivermen on an UNDEFEATED 2013 season! Congrats also to Coach Dennis Cornwell for being named 2013 North Conference Coach of the Year for the Mason Dixon Football League! Semi-Pro Football comes to the Northern Neck! Rivermen is the name of the team that is based here and they are the first semi-pro football team to be founded in this area. 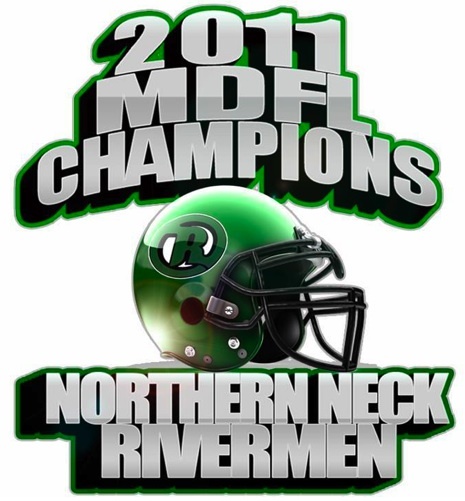 2011 Summer Season - MDFL Championship! Home games during the Spring season have been held at 370 Doc Stone Road in Stafford, and home games during the summer season at Colonial Beach High School on 1st Street. For 2013, they will be held at the new multi-million dollar stadium at King George High School. Their very first rehearsal was on May 2nd, 2009 and their first game was June 20th. Their schedule is packed with pre-season and regular-season games, so please check out their website or the events calendar page for the schedule so you can come out and root for the team! The team logo (pictured on the helmet above) was designed by PJ Seilhamer. Head Coach Dennis Cornwell (2010 Coach of the Year for the Northern Conference!) leads a roster of 25 players. If you're interested in either playing, coaching or cheerleading, contact him by calling 540-845-1009. They can be found on Facebook as well.